I would like to share a little information I managed to put together in the summer of '98 while in Jo Daviees Co. looking for information about my immigrant Seifert/Keller ancestors who hailed from the Massbach area of Bavaria. What I found was not only the Seifert/Keller families, but the Dittmar, Endriss, Krug, Schmidt, Thain's and several other families who all came from the same little Massbach valley of Bavaria in the mid to late 1800's to settle in "Rush Creek" or what is now called the Massbach/Derinda area of Jo Daviees Co. 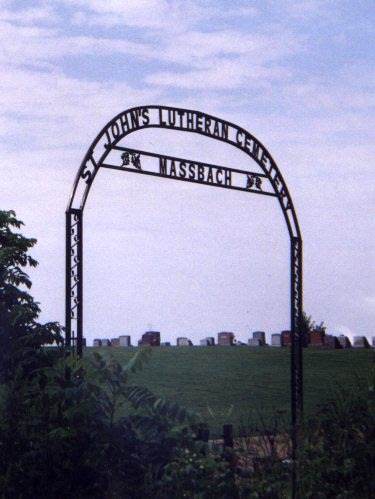 The fathers of St. John's of Massbach, IL were of the Lutheran faith and had come to settle in this beautiful hill country. Here they missed the Church in which they had been reared and longed for the Lutheran preaching of their homeland. Considerable difficulty was encountered in the attempt to sketch the history of St. John's Evangelical Lutheran Church from its beginning 125 years ago. However, from church history documents of 1997 and a hand written history of the church discovered in a corner stone capsule in 1998 during renovation, a few items of interest are in order. 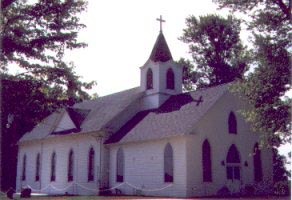 The congregation held it's first church service in the area in the year 1856 under the direction of a certain Pastor Snall from Black Oaks. An attempt to formally form a congregation failed at this time and it was not until a Pastor J. A. List from the Iowa Synod was appointed were regular services held. Early worship was held in the private home of Andreas Wurster, later in Maffit schoolhouse and at the McGrath schoolhouse in Derinda. Toward the end of the 1850's, a so called "Log Church" was built in Massbach and with periodic renovation was in use until 1900 when the first frame church was built. A beautiful and dignified structure with pleasing lines and a graceful high spire was however destroyed by a bolt of lightening and ensuing fire in July of 1913. In a few short months the church was rebuilt and dedicated in Jan of 1914, but was again destroyed, this time by tornado in April of 1922. Again with characteristic energy, the church was rebuilt and dedicated as St. John's Evangelical Lutheran Church of Massbach and is still in use today. 839 Catechumens were instructed and Confirmed. During the summer of 1998, the St. John's Evangelical Lutheran Church of Massbach, Jo Daviess Co., IL, was renovated to make entry for the physically impaired more convenient. During the process of construction, a cornerstone being cut into for the new entry way foundation, revealed a "time capsule" that had been placed during the church construction of 1913. Inside the metal box was a Bible in the German language and a hand written history also in the German language, of St John's by Pastor Herman Streeb who served from 1911 until 1917. In his account of the church history of 1900 until 1913, Pastor Streeb included a previous account of St. John's written by the Pastor H. Kumph for the dedication of their newly constructed church of 1900, detailing the history of the congregation and church from c.a. 1864 thru 1900. The first house of worship of St. John's was a small log church constructed c.a. 1859 and was still standing in 1913. The second and larger house was constructed in 1900 and was destroyed by fire in July of 1913. The location of the third St. John's was moved north east of Massbach, and was dedicated in Jan. of 1914 but was again destroyed, this time by tornado in April of 1922. The church was rebuilt on the same foundation and is the present Church of St. John's of Massbach. The "time capsule" was evidently not discovered or remembered by members of the congregation as no marking was made or a mention ever recorded that the corner stone contained such material as was discovered in 1998. Following is the english translation of the aforementioned hand written accounts given me by Pastor Daiker at the dedication ceremony in July of 1998. After barely 13 years, the congregation again faces the task of building a church. The church that started construction June 4, 1900, was hit by lightning on July 8, 1913, approximately 9:30 PM. It was totally reduced to ashes. The lightning ignited in the tower, likely in the belfry, and within two hours, the church was in ruin. We mourned the loss of our beautiful church and on the following Sunday had a "mourning" service next to the burned-down church; but at the same time resolved to build a new church. The most important part which the congregation had to consider and discuss was whether the church should be built again at the same location or move in the center of the community. So, it was decided by a majority vote (of the 12 voices) to build the church two miles further northeast. So, we started building happily and hope and pray that our God will bless our decisions and protect the workers from all bad luck and mishap. The following is a copied history of the congregation as it was found in the cornerstone of the burned-down church. On this day, 2nd Pentecost 1900, we celebrate the laying of the cornerstone of our church. So, it seems appropriate that we first and foremost pray to our merciful God and Jesus Christ and remember with praise and gratitude who is the true foundation and cornerstone of this church and who has for so many years guided and blessed us as our loyal shepherd and leader. Yes, the honor, praise and thanks be for the great Shepherd of His sheep and for His mercy granted the congregation until this hour. It was He who made one willing in one's heart to build a house for Him in which to preach His holy word and administer the holy sacrament. We also praise His loyalty because He has given us willing hearts and open hands who, now that our old church is too small, want to build a larger house for Him, to give the great name honor and praise. At the laying of the cornerstone, it seems fitting to look back into the history of our congregation which is about to build a new house for the Lord." "Our St. John's Lutheran Church congregation held it's first church service in this area in the year 1856. It was a certain Pastor Snall from Black Oaks who first tried to organize a congregation. At that time the effort failed. At the suggestion of several of the old members of the Ev. Luth. Primitative congregation at Derinda Center, IL., Prof. Dr. S Fritschel and several other pastors from the Iowa Synod would preach from time to time in the house of Groetzinger. In the year 1857, Pastor J. A. List from the Iowa Synod was appointed. He would, until construction of a parsonage, live with a member of the congregation of this parish." "Both congregations jointly appointed a pastor and maintained the parsonage. Services took place alternately at the house of Mr. Andreas Wurster, later in Maffit Schoolhouse and at Derinda in the so-called McGrath Schoolhouse. Toward the end of the "50's" the present and still standing - so called Log Church was built in Massbach. From the oldest member of this congregation, whose number however was greatly reduced due to deaths, some should be mentioned. Kaspar Heid, Lorenz Thain, Ad. Boehm, Ez Elflein, Ad Hesselbacher, Frau McBahwell, Joh. Rath, Andreas Endress, John Albrechtsen, Johannes Gerner and others. Wilh. Haas and these old members of the congregation managed the construction of the church. The first Elders were named John _____, Adam Hesselbacher and Gz Weible. At the time of the dedication celebration, Prof. J. A. List also delivered his farewell sermon and his successor M. P. Burke delivered his first sermon. M. P. Burke managed the job of a soul caretaker until the end of the year 1863. After his departure the position of pastor was unoccupied for a while, until H. P. H. Hempeler answered his calling. H. P. H. Hempeler took care of God's word and sacrament in the Parochie until 1871 when P. Theo Seyler came." "During P. Theo Seyler's time in office, Derinda built a new church and repair work was done in Massbach in 1874. P. Seylor tried to combine the affiliated congregation from Stockton with this one to build a new church closer toward Stockton, however, it did not succeed. 1879 P. List was appointed for the 2nd time. His successor became P. H. Bruckner, who officiated until 1891. 1892, P.J. Huter came. Under him the house of the pastor from Derinda was transferred to Massbach. There a new parsonage was built. As affiliated congregations came, other than Peter-Pauls congregation to Stockton, came another newly founded in Pleasant Valley on the Mt. Carroll road. During the time in office of H.P. Huter, the St. John congregation was newly organized and also incorporated. In 1897 the present Pastor Kumpf was called. The present directors of the congregation: Heinrich Albrecht, Nic Thain and Caspar Heid Jr."
"From the time of founding of this church until the present according to the church books, 864 baptisms, 283 confirmations, 97 weddings, and 190 funerals were performed. School and confirmation lessons were alternately held in Massbach and Derinda and regular Sunday school in all congregations." This should also be added: the church that burned down on July 8, 1913, was 32 x 60 ft. with a tower height of 70 ft. The cost was in excess of $3600. The now-to-be-built church shall be 32 x 50 ft. with a tower height of approx. 78 ft. and an alterniche of 16 x 10 ft. as an addition. Cost in excess of $5000�nothing worth mentioning was saved from the old church but the baptismal font and a cupboard out of the vestry. From spring of 1904, P.W. Osthoff served the congregation until autumn 1906. From spring 1907 to summer 1911 H.P.W. Reinecke served. In the fall of 1911, P.H. Streeb weas abbointed. During the time of H.P.W. Reinecke, an attempt was made to relocate the church and the parsonage to Massbach or closer in the vicinity of Massbach. The attempt failed. From June 4, 1900 to Sept. 1, 1913, 214 baptisms, 132 confirmations, 31 weddings and 65 funerals took place. I wonder what generation might see these pages? Perhaps at that time our flesh will have turned to dust long ago, the world will have progressed, but the word of God as is preached in our new church shall and will remain in eternity. Our thanks to Loren L. Seifert for contributing this narrative to the Jo Daviess Co., IL USGenWeb.